KGA has held a workshop for women on making fuel efficient stove using clay soils. The workshop was run by Roselyn Kabu and Yukiko Kasuya. 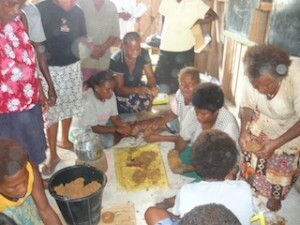 During the training woman learn how to make the clay stove, that reduces firewood use and time for collecting firewood. Compared to the usual cooking on an open fire, as practiced across Solomon Islands, cooking with the clay stove it is quicker for food to be cooked. This also saves womens time – in collecting and carrying firewood and in time spent cooking. An open fire cooking also uses a lot more fire wood than the improved stove. Preparing the stove with a mix of clay, soil, and grass. To preserve our nature in Solomon Islands, what we can do around us? One way is to reduce how much we are using firewood in your kitchen. In other country, they have some good ideas to reduce using firewood like solar cooking. 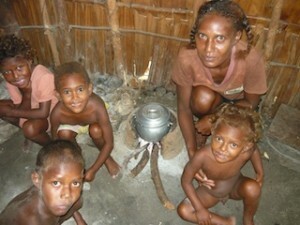 And also we can improve our stoves and cooking methods to reduce firewood here in Solomon Islands. If we improve our stove, we can see some changes. To make stove, you need clay soil, which is sticky and heavy soil, garden soil, ashes, dried grass and water. 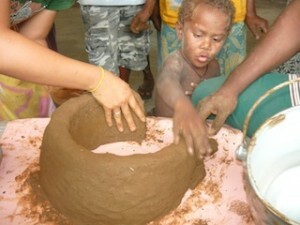 this is Wandamu from NARI, Kerevat, Papua New Guinea. As i mentioned in our last workshop in Lae, PNG. I am following this clay stove issue with interest. i will email later regarding this.